Catherine de Valois, the youngest daughter of King Charles VI of France and Isabeu of Bavaria, was born on 27 October 1401 in Paris. 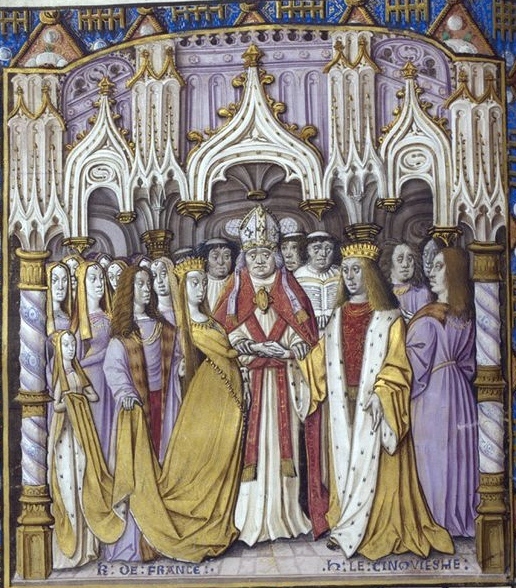 Unlike many royal brides, Catherine had the chance to meet her betrothed, Henry V of England, before the wedding. The meeting took place at Meulan and Henry was instantly smitten with his beautiful bride-to-be. However, he didn't let love blind his reason and demanded the return of the former English territories in France as part of the marriage pact. The parties agreed to sign the treaty of Troyes, which ended the war between the two countries, returned Normandy and Aquitaine to England, and made Henry regent of France during the dauphin Charles' lifetime and his heir at his death. It was a triumph for the English and, on 2 June 1420 their King married Catherine de Valois. The following February, she was crowned queen in Westminster Abbey. Then, Henry left her and went on a war campaign, something that would happen very often in the future. Lisa Hilton, in her Queens Consort book, has calculated that in 26 months of marriage, the couple spent only 5 months together in England. But they were together enough to conceive an heir and, on 6 December 1421, Henry VI was born at Windsor. Henry, though, would never meet his son. He fell ill during the siege of Meaux and, on 31 August 1422, he died. A few months later, the King of France died too. 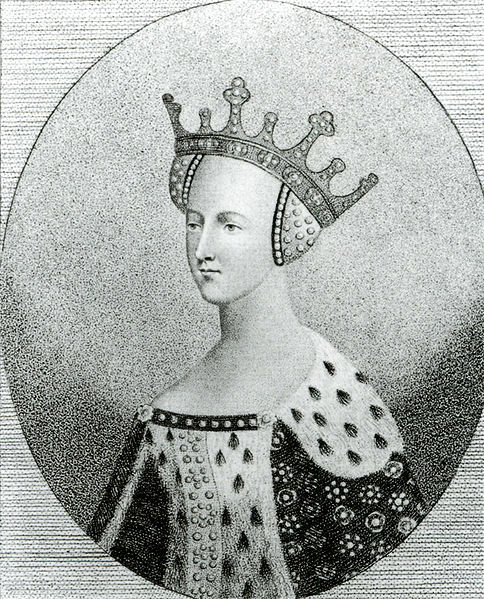 At 21, Catherine was already a widow and her 10 month old child, King of England and France. And the history of France would have been very different indeed if Joan of Arc hadn't helped Charles VII to defeat the English and be crowned King of the French. Catherine didn't act as regent for her son. Henry V's brothers, John Duke of Bedford and Humphrey of Gloucester did. She was however able to spend a lot of time with her son and doted on him. From 1427, mother and son also lived in the same house. The decision wasn't motivated by maternal love, but by the need of Parliament to keep a close eye on her. Catherine had started an affair with Edmund Beaufort, Count of Mortain and it was rumoured she planned to marry him. However, Parliament was strongly against the match and so passed a bill stating that if a dowager Queen married without the king's consent, which could be given only when he reached his majority, the husband would lose his lands and possessions. Any children resulting from the match would still be members of the royal family though. This law was enough to make Beaufort lose interest in Catherine. But Catherine was still determined to follow her heart and, when a few years later, she fell in love with Owen ap Mareududd ap Tudor, she married him. We don't know much about Owen or how he met Catherine, but it is thought that he was connected with her household in some way. He was a commoner, though, so he didn't have anything to lose by marrying Catherine. But as a Welshman he didn't have the same rights as an Englishman. Harry IV, after a Welsh rebellion, had in fact prohibited them from, among another things, carrying arms or living in certain towns. Catherine was French so she probably didn't know the differences between the Welsh and the English. In any case, Owen was given the status and rights of an Englishmen by Parliament in 1432. Parliament's decision to recognise the marriage was probably partly due to the fact the Queen was already pregnant with the couple's first child, Edmund, when she got married. The pair would go on and have four more children, Jasper, Owen and two daughters, one of whom died in infancy. In her last years, Catherine was affected by a "long and grievous malady" and eventually retired to the Bermondsey Abbey, where she died a few months later, in 1437. Catherine de Valois was a woman who had the courage to make her own decisions and follow her heart. She didn't do much as Queen, as her marriage was so short, but her relationship with Owen did change the course of history. Her son Edmund married Margaret Beaufort, whose father descended from King Edward III, and their son would become Henry VII, the first monarch of the Tudor dynasty.